I am generally a fairly devoted mother. I drive my kids to their various extra-curricular and social activities (and I don't usually complain). I get their school supplies and uniforms in order at least a couple of days before school starts. For the most part I make sure they are happy, safe and fairly well fed. And I'm a pretty caring wife. I make sure there is something in the house for my husband to eat when he gets home close to midnight. I look out for his dry cleaning and other minutiae. I even occasionally buy him gifts. But there is one exception. And it has to do with eggplant. But I do enjoy eggplant. I really, really do. 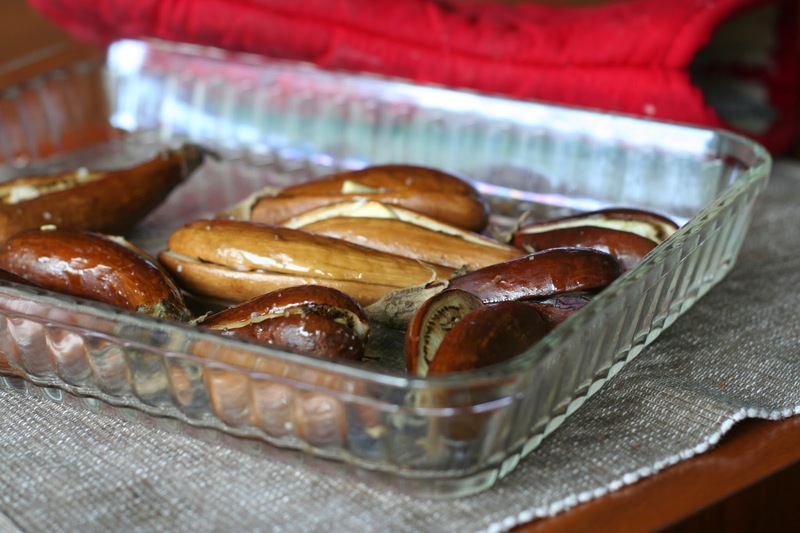 But - and I'm not proud of this - when I brought a plate of glistening Roasted Mini Eggplants to the dinner table, knowing full well I would be the only one consuming them, I didn't feel one bit of guilt. I graciously asked if anyone wanted any. I offered to share. But when they turned up their noses, I happily ate the entire plate of eggplants. Yes. Myself. And of that I'm not ashamed. 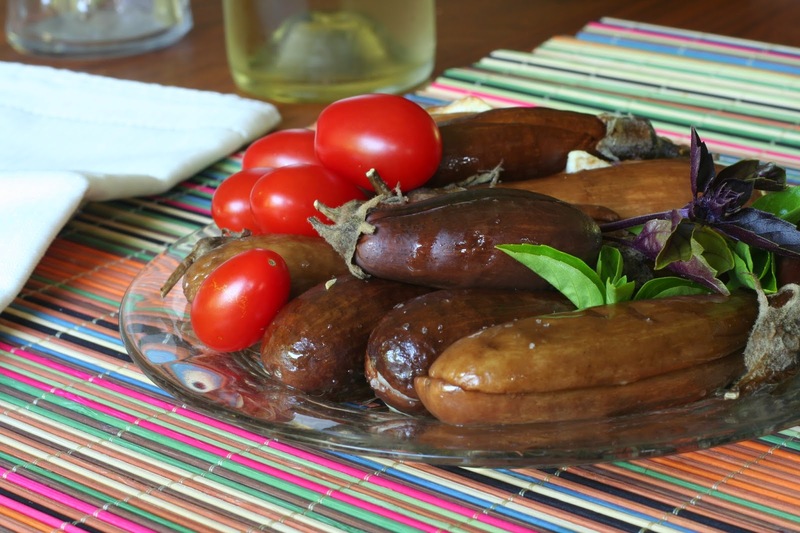 Yeah, you really do need mini eggplants for this dish. Sorry, guys. Try your farmers market in the summer. Or Whole Foods. Preheat the oven to 400*. Wash and dry the eggplants. Peel the garlic cloves and slice them thin. You'll need 20-or-so slices. Use a knife to make a slit from the tip of the eggplant all the way almost all the way up to the stem. You want to leave the stem comfortably intact, so don't get super-close to it. Use a pastry brush or paper towel to coat a glass baking dish with oil. 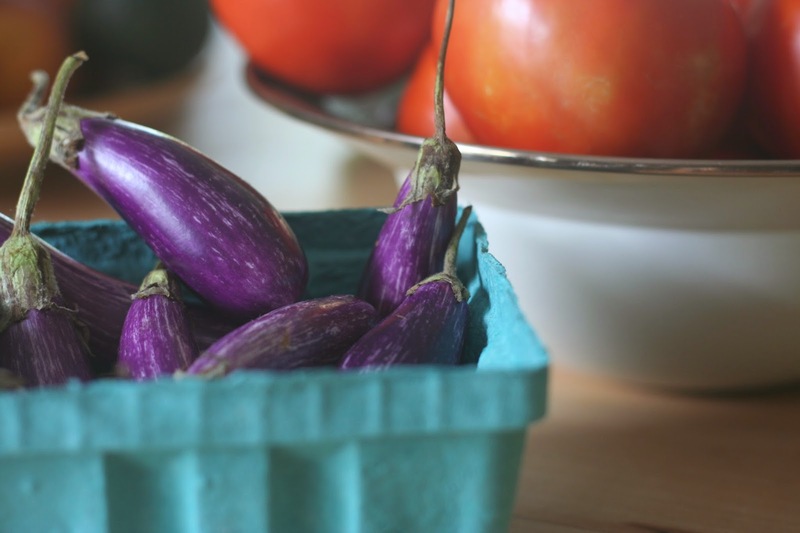 (You'll need a dish large enough to comfortably hold all of your eggplants.) Then pour a few tablespoons of oil into a cup or shallow dish. You'll use that to brush on the eggplants. 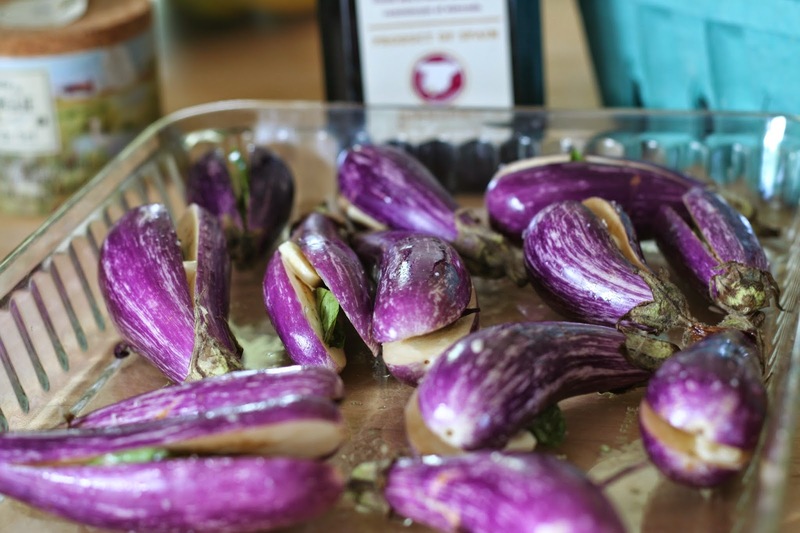 Working with one eggplant at a time, brush the insides and outsides generously with olive oil. 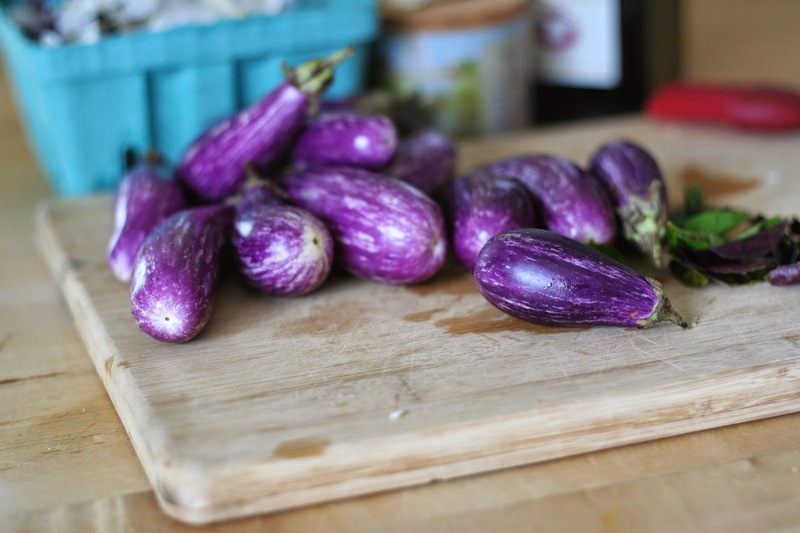 Sprinkle a bit of salt and pepper on the inside of the eggplant. Slip in a garlic clove or two, plus one or two basil leaves. 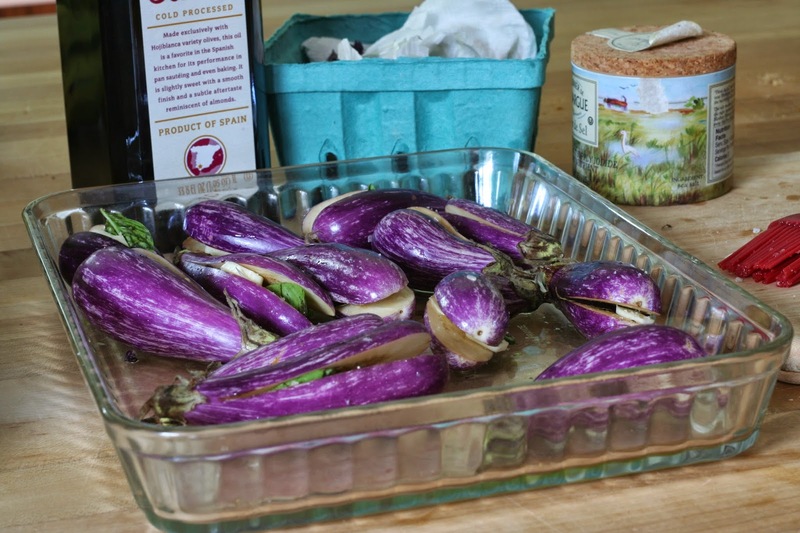 As you go, lay each eggplant in the oiled dish. When you're done, sprinkle some salt and pepper over the eggplants. Bake for about 30 minutes, until the eggplants look warm through and are beginning to soften. Serve warm or at room temperature. These look great! I apologize for not trying them. The pictures look great - and they looked even better in real life.... Maybe I should have tried them, after all. :) I love all your posts - and they're written so wonderfully, too (in my humble opinion - I probably don't qualify to be a judge of such awesomeness). Uh oh, are you like planning to try them next time or something? PLEASE don't. LEAVE THEM FOR ME!! 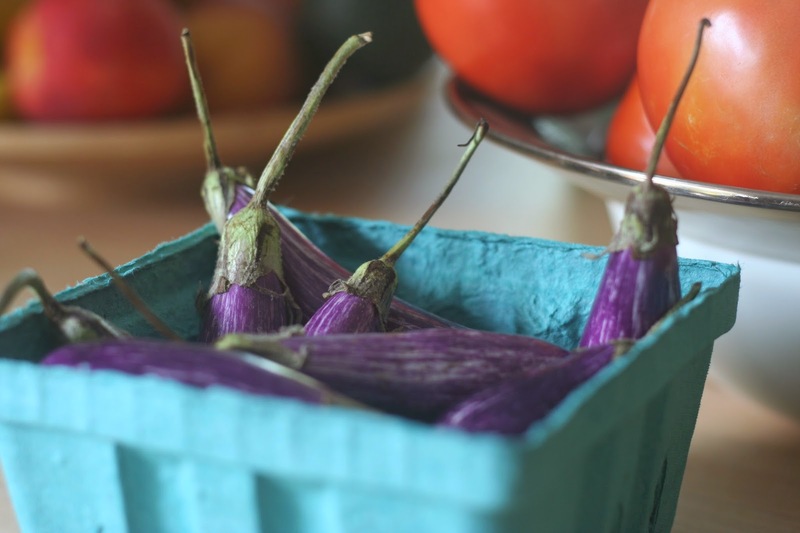 I once got tiny eggplants like this in Oregon called Fairy Tale Eggplants. Must be the same thing. Your recipe is lovely. 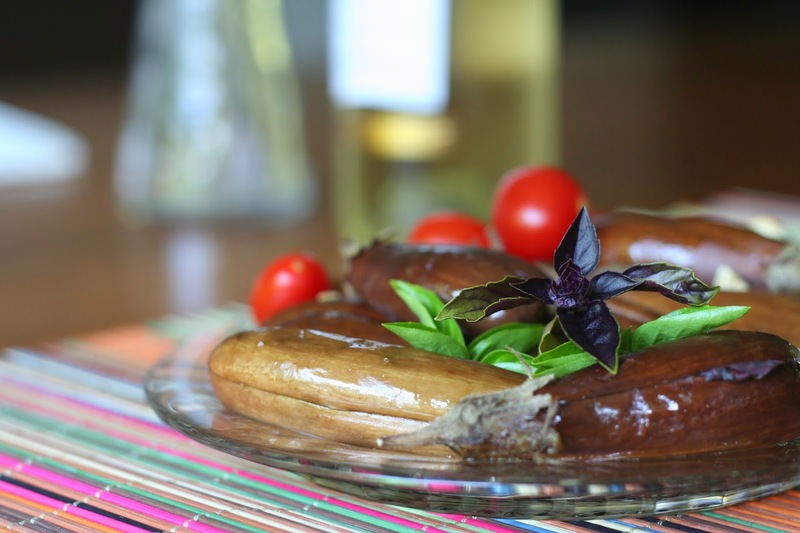 It looks like a better way to cook eggplant because they absorb so much oil when you cook them in a skillet. Yes! This is unusually low in fat for an eggplant recipe.